A while back I noticed that one of the slats in the Jalousie window in my door had a chip in it and needed to be replaced. Pretty common with these things, they rattle around on windy days and when you close the door, it will bang pretty severely. Chips will happen. The Old Line Hardware Stores around here will have replacements and will cut them to fit. Bring in the old one, ask nice to have it replaced and you're back on the road with a nice piece of glass. 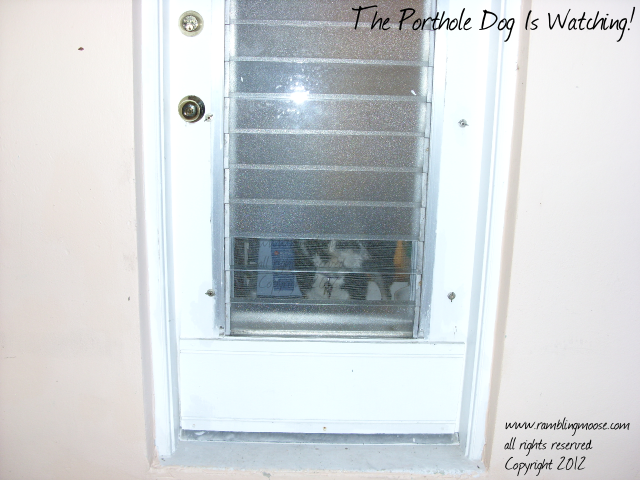 In my case, I also have a very curious dog who would stand by that door every time I went out to work on the car. Since I'd be on the other side of that door rattling around with hoses, screwdrivers, and other oddball tools, it would be nice to have her have a portal to the outside world. Neighbors have dogs that climb on the furniture, but my Lettie is too well mannered for that sort of thing. When I went to that hardware store, I insisted on clear glass. The woman behind the counter said that they'd be able to see in. My response was yes, but that will let the dog see out. I got my glass, and set it in the door and that immediately gave my dog a new place to watch. Now when she has a Perimeter Search to do, Lettie will check that door first, then the bedroom and the rest of the rooms seeing where part of her flock has disappeared to me. Silly dog, I'm Moose, not a sheep.